↑ Lewis, TG; Nydorf, ED (2006). "Intralesional bleomycin for warts: a review.". Journal of Drugs in Dermatology 5 (6): 499–504. PMID 16774100. ↑ Shaw, P; Agarwal, R (2004). Shaw, Paul HS, ed. "Pleurodesis for malignant pleural effusions". Cochrane Database of Systematic Reviews (1): CD002916. PMID 14973997. doi:10.1002/14651858.CD002916.pub2. Claussen, C.A. ; Long, E.C. (1999). "Nucleic Acid Recognition by Metal Complexes of Bleomycin". Chem. Rev. 99 (9): 2797–2816. PMID 11749501. doi:10.1021/cr980449z. Shen, B.; Du, L.C. ; Sanchez, C.; Edwards, D.J. ; Chen, M.; Murrell, J.M. (2001). 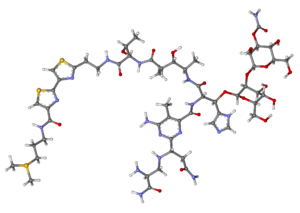 "The biosynthetic gene cluster for the anticancer drug bleomycin from Streptomyces verticillus ATCC15003 as a model for hybrid peptide-polyketide natural product biosynthesis". Journal of Industrial Microbiology & Biotechnology 27 (6): 378–385. PMID 11774003. doi:10.1038/sj.jim.7000194. Ova stranica je zadnji put izmijenjena 10:44, 24 maj 2014.